Jacob calls it "aging tastes", which just sounds so ominous, so I'm going to stick with "I'm going backwards" with my interest in motorcycles as of late. And you simply cannot go any backwards than with a truly vintage specimen. A 48-year old specimen, to be precise. I didn't know about this bike before two weeks ago, and what I know now as of writing this is only marginally better than then. 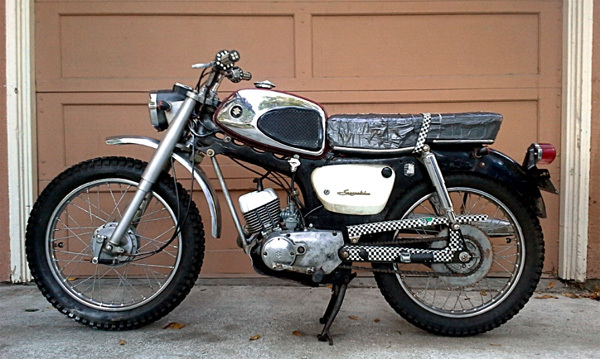 It had been just another one of those Craigslist finds I came across, and not knowing anything about the bike, only the following keywords really piqued my interest along with its handful of photos: 80cc two-stroke, engine in good shape, bike runs strong. But what really got me to contact the seller were the following words: street legal. I just had visions of scooting in town on the bike, when I would need to run to the parts or hardware store for a weekend afternoon project I'm in the midst of, and it's a bit of a distance for the bicycle but still not far enough to drive in a car. Instead, I can just kick-start this bike and be back just as quickly as I jet off. I was sold on the idea, just had to finally see the bike in the flesh, so I made arrangements to meet the seller. I tell you, I was ready to take the bike home after finally seeing it. It was smaller than I anticipated, just slightly larger than my Honda CT70, but still smaller than my Hawk GT. I think this bike could even double as a pit bike, given its size and light weight. 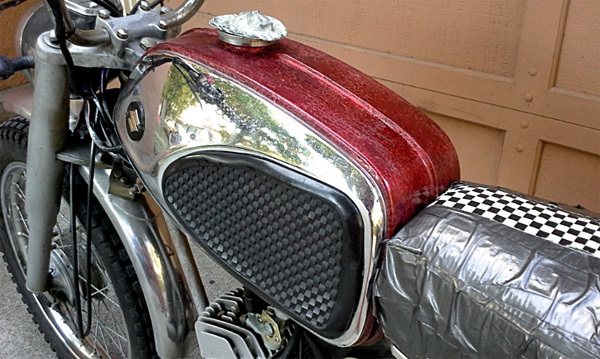 It didn't hide nearly five decades of its age, and the seller's spray paint-job on some parts including some the cases, along with stickers around the chassis and duct-tape all over the seat to keep it from tearing anymore than it has didn't really help its overall physical state. The seller had mentioned having the wiring harness overhauled so that he could have front and rear blinkers installed, yet somehow couldn't get the actual blinkers to flash when activated. The headlight works as well as the tail light, however the brakes do not activate the brake lamp. 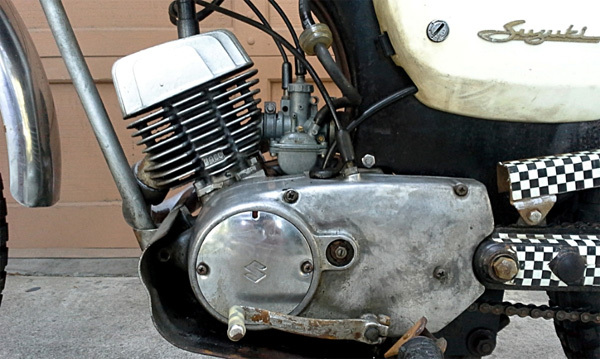 Regardless, the engine would kick-start to life with relative ease, the transmission went through all four of its gears without issues, and the bike rode steady even with a slightly tweaked front end, the latter almost omnipresent with older bikes I've noticed. Far as I could tell, the bike was structurally sound all around, and so I wanted to take it home. The only problem was that the seller and I couldn't agree on the price. The seller was asking a price that, while not exorbitant for the bike, was well above the bike's average value as sourced from Kelley Blue Book (KBB). I had offered to pay the average value, prompting him to come down on his asking price, but still not near my comfort level. We shook hands, and I told him I'd think about it, then went home with an empty truck bed. 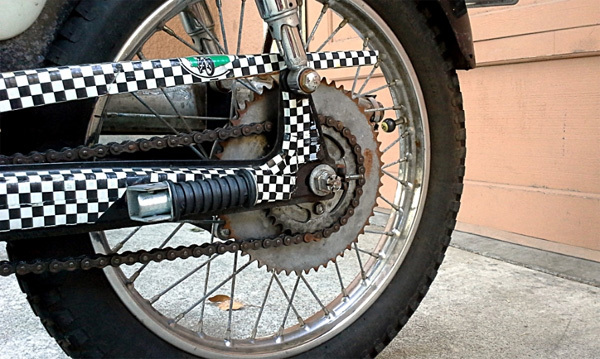 A curious thing: Dual rear sprockets – the large one for trails, the smaller for cruising. I don't typically pay KBB's average value for a used motorcycle, and in fact I don't think I've ever had, let alone paying OVER a bike's average value. That has not been my modus operandi, and I wasn't sure if a 48-year old motorcycle was where I would start deviating from my m.o. 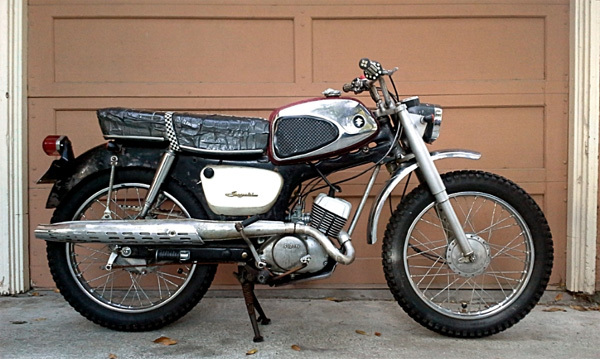 In the next week after seeing the bike, I had been scouring other ads for comparable motorcycles, all the while reading up here and there about the '66 Suzuki. 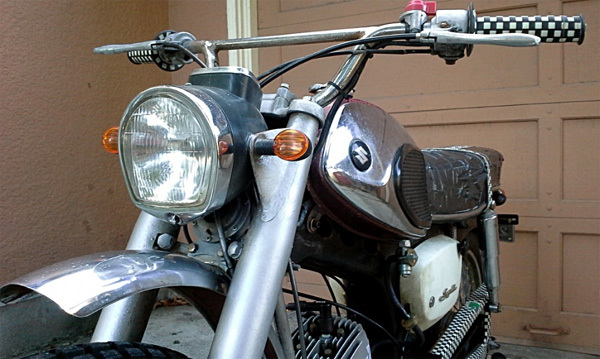 I came to realize that I really wanted the Suzuki, and the fact that this was the first time I had seen the bike for sale locally in the Bay Area, I didn't know where or if I may came across another one again. It had become a question for me of whether I would spend more than I normally would to take ownership, or keep my money and let a chance to own an uncommon bike slide? Principles be damned, I can always earn the money again, so I contacted the seller and agreed to his price. I drove home from my second trip to meet the seller with the bike in my truck bed, with no trace of remorse from what I paid for it. It still blows my mind at the time of writing this that I get to own and ride a motorcycle made nearly two decades before I was born. It's not every day I get to relive history before my own.